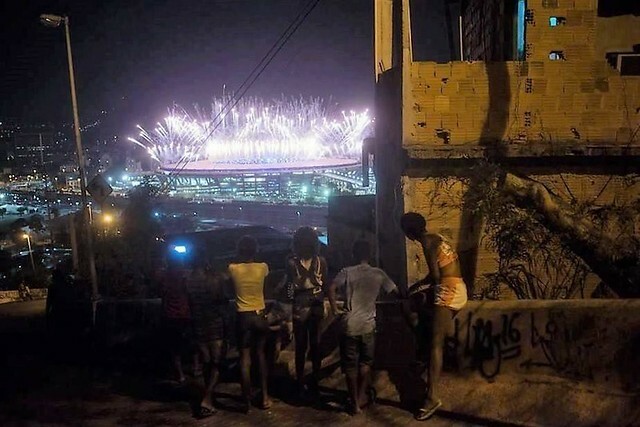 Residents of Mangueira favela watch the Olympics’ opening-ceremony fireworks at Maracana stadium in Rio de Janeiro, Brazil. Photo Credit: Tercio Teixeira. There have been two realities present throughout the Olympic Games in Rio de Janeiro. One is of festivity, great athletic accomplishments, excitement, exuberant nature and urban scapes. The other is a hidden reality characterized by gross violations of human rights, violence, racism, exclusion and deprivation. These two faces are contradictory, yet characteristic of a deeply unequal country with a small strata of millionaires and the vast majority of people living on less than US$ 500 per month. Rio de Janeiro, which became the world’s first city to receive the title of World Heritage and Cultural Landscape (UNESCO 2012), is perhaps the city that best represents the world today in terms of extreme, yet inseparable contradictions. Extreme poverty and wealth, crudeness and sophistication, ugliness and beauty, privilege and exclusion. The elites in Rio, aided by the local government and the major media (controlled by a few families), have become masters in the art of masking these contradictions. To do so, they have made use of an array of tools, under the guise of the Olympic Games: spectacular shows, super-sized security forces (to intimidate or incarcerate protesters), the clearing and hiding of slums behind billboards (to try to conceal poverty), and mega constructions. Included in the last category is the R$300 Million Museu do Amanhã, a science museum funded by the city of Rio de Janeiro and others that cost nearly five times the budget initially allocated for the project. In order to make room for new developments and as part of an urban “beautification” campaign, according to official government figures, around 75,000 people have been forcibly resettled. Most of them are low-income. They have been moved to either monotonous mono-functional peripheral housing compounds, financed by the country’s main social housing Programme, or to temporary bungalows without a clear future. Some communities that have been destroyed to make way for the olympics’ infrastructure, such as Vila Autodromo or Morro da Providência, have gained publicity, but will likely be quickly forgotten. Meanwhile, many other stories of suffering and injustice remain untold. In addition to the social toll, the Olympic Games in Rio have come at a high financial cost. Of the estimated U$4.58 Billion in expenditures, about 60% came from public sources. The federal, state and municipal governments have disbursed more funds than originally budgeted in order to support massive construction works. Most of them are located in areas selected by local elites who stand to gain financially. For example, Observatório das Metrópoles, an urban research institute focused on Brazilian cities, recently reported on the construction of massive works in the middle-upper class Barra da Tijuca and the Saúde neighbourhood in the old harbour. Their research points out the embedded economic interests of the local elite in increasing land and housing prices and in opening new frontiers for real estate developments. Observatório das Metrópoles has also revealed that investments in Rio’s transport network and its various modalities have become a mechanism for increasing real estate prices and capital accumulation, pushing lower-income citizens to the city’s peripheries and slums, far from their sources of employment. This situation is aggravated by the high costs of public transportation in Rio, a service that is mostly privatized and owned by the same local elites invested in pushing out lower-income citizens. Perhaps the most glaring scandal is that the government of the State of Rio de Janeiro recently announced bankruptcy. This comes after years of ill governance, corruption and the provision of tax exemptions for many of the large companies with a stake in the Olympic Developments and related services, owned by the local elites. As if to rub salt into the wound of the average Rio residents, the declaration of bankruptcy was followed by announcements about budget cuts in public health and education services. What more evidence could show the burden that the Olympic Games have become for the least privileged inhabitants in the city? Now that the Olympics has concluded, Rio’s future is uncertain. One possibility is an increase in social unrest and even urban violence. Another is the chance that the unwavering festivity of Rio’s inhabitants will make it easy for local elites, using impressive shows, buildings and infrastructure, to mask the contradictions between the two faces in the city, misrepresenting their plans for private accumulation as being in the public interest. Post by Jordi Sanchez-Cuenca & Professor Maria Ines Sugai. As Australians visiting Rio for the Olympics it was interesting to read your article. We loved Rio and the Olympics were fabulous. The people are lovely and we were very impressed. However we were well aware of the protests and problems. Those protesting were certainly seen and photographed by the foreigners. Thus it was great to get some more facts from you. Very realistic and deep article. We can not talk about Olimpys Games without Social inclusion. Thanks for show the voices and the situation of all the people unseen in the Olimpics. As a brazilian and a attendee of the Olympic Games, which was really a great event, I could notice the poor improvement the big investment brought to the city as a whole. It is a pitty Rio’s government didn’t see the Games and the big expenditure as an opportunity to change the city to previlege its own inhabitants and not just to be prepared for the event. Brazilians are ¨drunk¨ now with the feeling of ¨the work had being done¨…it is true we were all afraid of a big failure…and it was not! Anyway, the pressure to deliver a beautiful, ¨harmless¨ event had blinded us for the great changes we could have now, as Barcelona did in 1992!